Without any prompting or encouragement, Clara stood up and let go of the furniture. 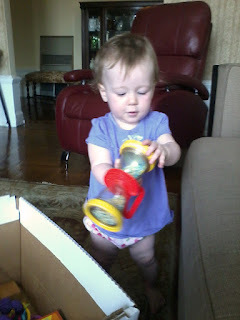 For a little over a minute she shook her hourglass toy while standing, perfectly balanced. I felt like whooping and screaming but instead tried to imitate Clara's nonchalance. (I snapped these pictures with my cel phone when she wasn't looking) Here she is doing something amazing, something she has never done before, and she's cool as a cucumber. Not only that, she ups the stakes by playing with a toy at the same time. After she finally sat down, my mother and I applauded. Clara looked at us like: "Seriously? You're clapping at this? You guys are sooooo EASY." 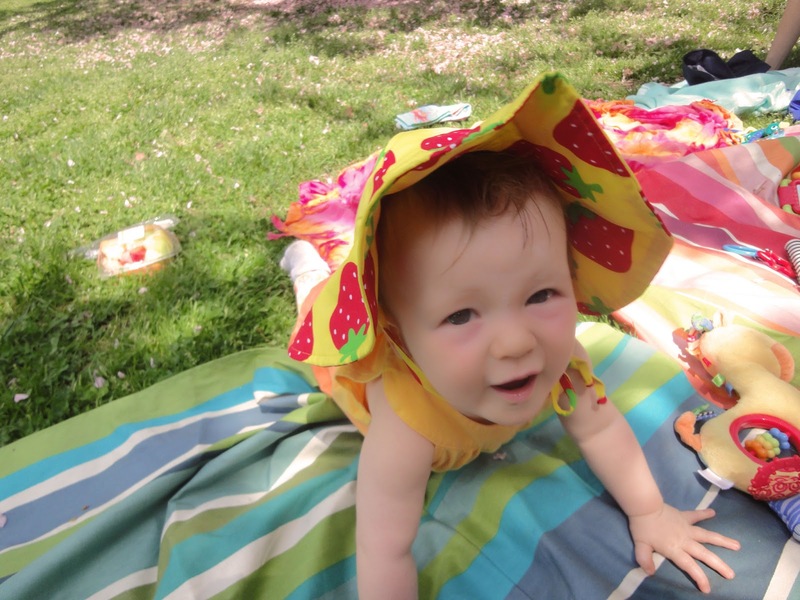 Clara will be one year old in a little over three weeks and she continues to amaze me and her dad on a daily basis. Yesterday, while getting her ready to go out I said to Clara: "We're going to see you friend Amado and your friend Billie." To which, Clara replied: "Billie!" Does she actually know Billie's name? Was she just repeating what she heard? If so, I have never head her say anything close to those sounds before. After I left for work this morning, Gerald was sitting in the glider chair in her room while Clara played with her toys. 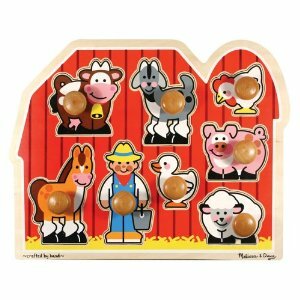 Without any prompting from him, Clara picked up the chicken puzzle piece from her Melissa and Doug farm puzzle, held it up for her Daddy to see and said: "Cluck. Cluck. Cluck." Needless to state, Gerald was thunderstruck and immediately called me to impart the news. Now, Gerald and I do a lot of holding up the pieces for Clara and saying things like: "The cow goes Mooooo." But up until now it has been just the adults saying the "Baaaaaaas, Neighs, Oinks, and Cluck Clucks." All I can say, is it is much more impressive when Clara does it. Clara has been crawling and cruising for a month and a half now. It wasn't enough for her to just crawl - she had to start pulling up and walking along the walls and the furniture the same day she showed off her crawling skills. She's incredibly fast. My (so far) successful attempts at childproofing the entire apartment have created a large space for her to bullet back and forth in. I will walk out of her bedroom where she's busily playing, traverse the apartment to the kitchen and 30 seconds later Clara will appear in the the doorway of the kitchen. She is that fast. She's so good at the crawling and cruising it's easy to forget that she's a baby who's only been doing this for 45 days. She sometimes is in such a hurry her oversized baby head gets too much momentum and topples over her arms resulting in a bumped head on the floor and many tears and cuddling. The advent of two front teeth also resulted in a cut lip during one of her quick-crawl head over arms mishaps. Seeing Clara bleed for the first time was a heart-stopping moment. Clara was less upset and recovered more quickly than I did. Babies are resilient and babies do everything so fast. Clara was 19 inches when she was born. Today she's 30 inches. That means she has grown 11 vertical inches in 11 months. If I grew 11 inches in 11 months I think I'd just stay in bed in my pajamas and watch romantic comedies. But Clara takes it all in stride - except for when she naps. She goes from an energized baby doing laps around the apartment to flat-out sleep in about 30 seconds. These are her power naps. Restocking up her supply of super speed for the next few hours of the day. It takes her a while to wake up from these deep-sleep naps. 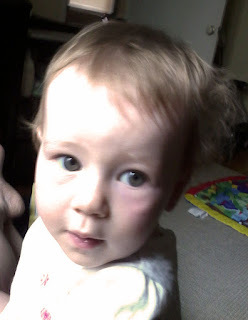 This is her, sporting great nap-hair, yesterday afternoon. 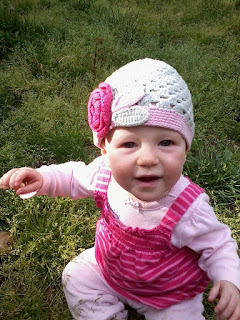 As Clara approaches the 11 month mark, I am constantly amazed at how much she changes on a daily basis. I feel like I can almost see her growing - it's that fast. 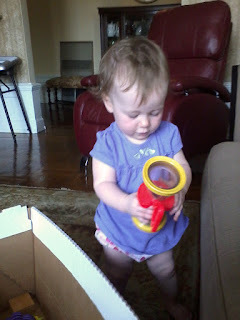 As she plays, and crawls, and cruises around the apartment I catch glimpses of other people. Sometimes when she smiles, I see my twin sister Becky. Just the other day I was marveling at her eyebrows which have just a tinge of red...(where did that come from?) and in that instant I could see my sister Sam. Her eyes - a deep blue-green hazel eyes are her own unique color but they are shaped just like her father's. In fact, all of Gerald's family seem to share that slightly cat-lidded look. Happily, she also seems to have inherited her father's toes but her tiny mouth is pure Mama. My mother is convinced the swirl of hair on top of her head in from me, and just this morning Gerald showed me a baby picture of his father and it turn's out, Clara has Skip's cheeks. Clara loves listening to music and people singing and she's getting that gene from both sides. Directly from her father, and more distantly on my side from my two sisters. As she crawls around using her left leg as a propeller I wonder if she will be left handed. Myself and her paternal aunt and grandmother are all left-handed. Gerald scoffs at this and points out that she usually uses her right hand when eating. We'll see about that! For all her similarities to her family, Clara's personality is one-of-a-kind. I love watching that grow the most. She constantly makes me and her father, and everyone around her smile - and that trait is unique to Clara.